Why do this? Simple: so I’ll know how many plants to start from seed and how many to plan on buying. It also ensures that I’m creating solid companion planting schemes; I consulted my Companion Planting book while coming up with this plan. I’m growing quite a variety of veggies and herbs this year, huh?! Hopefully I am not being too optimistic about how many plants I can crowd into the garden. 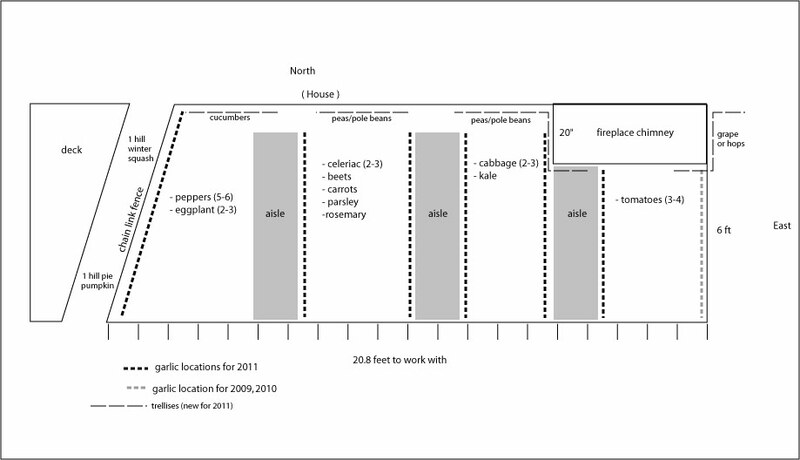 I will post an updated version of this diagram after we plant, so we can compare my current snow-covered veggie lust with the cold reality of planting day. In May. Will spring ever get here? Categories: Gardening, Permaculture, Practical | Tags: companion planting, Permaculture | Permalink. A recent Dutch study showed that full-fat fermented dairy was inversely associated with death from all causes and death from stroke. A large study of Australians, published in 2010, showed that full-fat dairy appears protective against cardiovascular death. Yet another study, this one from 2005, showed a significant inverse association between full-fat dairy consumption and colorectal cancer. Another study still linked vitamin K2 from full-fat cheeses to reduced risk of death from all causes, as well as a reduction in aortic calcification. And a review from 2009, examining 10 different dairy studies, noted that some types of saturated dairy fat have a neutral effect on LDL, and full-fat cheese—compared to other dairy products—seems to have the strongest inverse relationship with heart disease. Categories: Nutrition, Practical, US Food Production | Tags: milk, Nourishing Traditions | Permalink. I planted 40 alpine strawberry plants as well as a currant bush in May ’10. 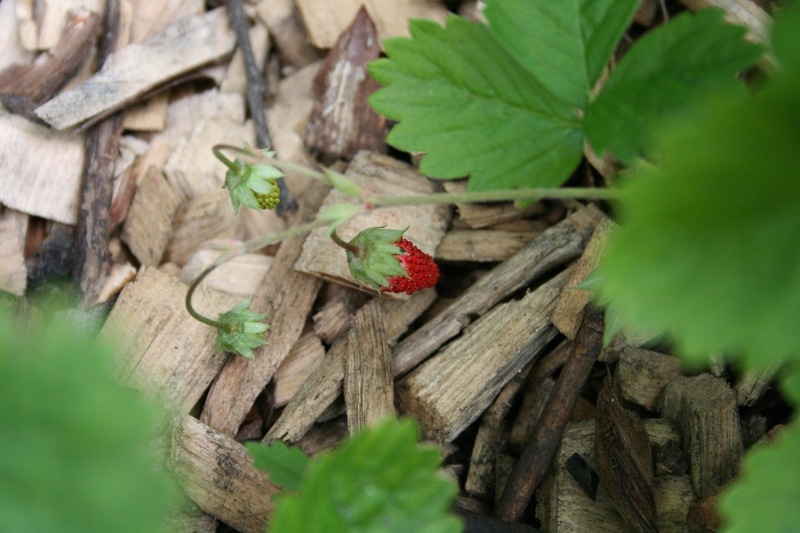 The alpine strawberries were wonderful, and fruited in a few different light scenarios. The plants get to be about 6″ tall, so they work great as a border. I’ve heard that they are difficult to start from seed, so I purchased mine at the Friends School Plant Sale. They were very inexpensive. I’ve also read that they will not set fruit in deep shade, so be aware of the note above. I also planted lingonberries, but I think I will have to move them to a full-sun area, if they even survived the winter. They looked pathetic the whole year. My dreams of lingonberry pancakes may not ever come true, alas. The currant did all right, though it stayed quite small, which is another good thing to note: in part shade, bush-type plants will not reach the size listed on their plant tags, so don’t worry if they are slightly more crowded than indicated. I got this list from a fellow Master Gardener. I’m a little skeptical, especially about the root crops like carrots, beets, and turnips. Greens work great in part-shade, though; it keeps them from bolting too fast. I will consult this list when I add new raised beds in my partially-shaded back yard this spring and record how it goes. UDPATE, April 19, 2013: I’ve separated the list above into two categories. Really, I’ve realized that only greens can tolerate a low level of sunlight. Root vegetables need a solid 6 hours. My cilantro, parsley, fennel and dill have all been re-seeding themselves and coming back, all over the yard, in several different lighting situations. I have so much parsley that I actually use it in place of lettuce sometimes. Mint can be rather invasive so planting it in heavy shade helps control it. We planted mint in a VERY shady spot last year and it did very well. I plan to expand that operation this year. I’ve not tried mushrooms or ramps, so I’ll have to get back to you on that. This is by no means a complete list. Anyone have anything else to add? Update, 2/21/2011: Edible Hostas? Interesting idea, Renee! Categories: Gardening, Permaculture, Practical | Tags: Permaculture | Permalink. My little guy gets eczema every winter on his cheeks, and I’ve not had a lot of success with various creams from stores, even from the co-op. Here’s one we’ve been using all winter that actually works, and it’s homemade from stuff I had on hand anyway. Nice! 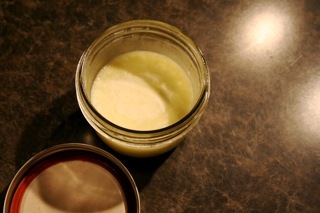 I made up the recipe myself, but it was based on information I’ve read in Nourishing Traditions and Herbal Medicine. 1. Melt everything together on the stove over very low heat — takes about 5 minutes. 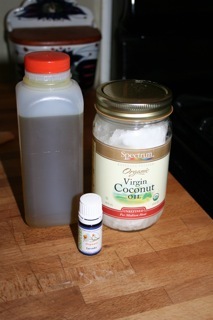 This is the easiest way to incorporate the olive oil with the rock-hard coconut oil. 2. Chill it out in the refrigerator until set. That’s it! 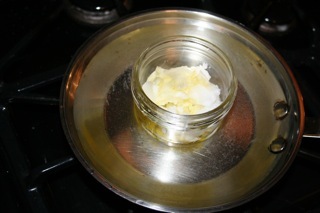 I added the olive oil to make it a little softer and easier to apply. If you keep your house very warm in the winter, you might find that it’s too runny with the olive oil in it, so adjust the recipe accordingly. Update, 2/14/2011: Clarification: I am not claiming that this cream cures eczema, only that it relieves symptoms better than any other I’ve tried. We still have to apply 1-2 times a day to my son’s cheeks to keep them clear. Categories: Practical | Tags: DIY, Nourishing Traditions | Permalink. I just signed up for the Design with Nature conference later this month! I’m super excited. I’ve been wanting to learn more about landscaping. Naturally, I’ll take copious notes and report back to you all what I learn. The conference is February 26 at the St. Paul Campus of the University of Minnesota. Read all about it. Categories: Community planning, Gardening, Permaculture, Practical, Theoretical | Tags: U of M Extension Service | Permalink.